There’s no good way to diagnose dyscalculia in an online quiz, but these dyscalculia screener questions should help you decide if you should seek additional help. The most important part about these questions is you thinking through the answers. While the dyscalculia screener questions are all based on the symptoms of dyscalculia, having some of them is not necessarily a qualifier. Does your child have good reading, writing and verbal skills? Can he/she keep track of time? Can the person in question do math in their head? Are the basic math facts in question? Basically can he/she add, subtract, multiply or divide? When working with numbers, does your child have trouble recalling numbers? add numbers?, omit numbers? reverse or substitute numbers? 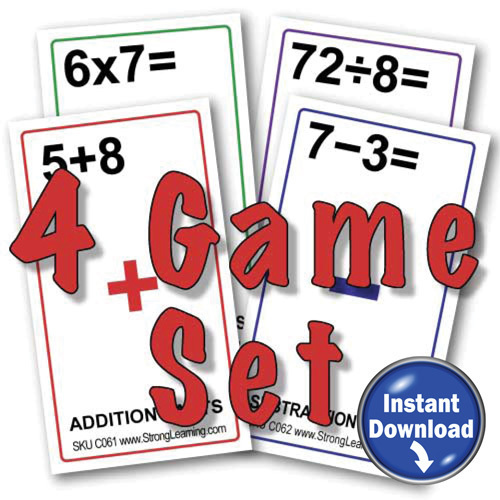 How about the concepts, can you child remember math concepts or formulas or math’s rules? Those are the math questions. If your child can’t do those things, you may be still dealing with a typical child and their math woes. If you answer the following questions in a similar manner, then we have a much clearer idea that the brain isn’t a big fan of numbers. Does your child know hot to handle money, like making correct change? How about direction, does you child have a good sense of direction or does he/she get lost easily? Sequencing. . . Can your child recall the correct squence of events that took place in the past? Does he recall going to the mall before the movies which was before dinner? Finally, can your child accurately recall where each number is on the face of a clock? If a good number of things are causing your child problems, we’d like you to do two things. 1. 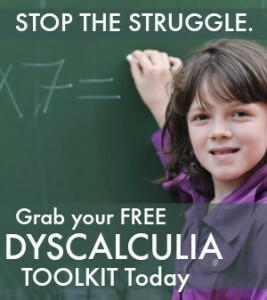 Pick up a copy of our Dyscalculia Toolkit right here for free. 2. Secondly, call us at 845-628-7910 so we can help you understand what comes next. Go from dyscalculia screener questions page to the our range of dyscalulia articles using the archive links right and below. I believe my son who is now 19 has some dyscalculia in math. He just finished his first year as a freshman in college. He had to drop his calculus class since he was not doing well. We have provided tutors in the past and all said he understood what was being teached, but when it came to taking the test he just does not do well. He says he freezes up and all he learned becomes blank. On word problems he second guesses himself with the questions. Do you have any recommendations? We live in South Orange County, Ca. Look in your area for tutors or counselors who help students with text anxiety. There may even be an office at his college that helps students with learning and testing challenges. Why did you delete my questions and comments? 🙁 I need help because I have Dyscalculia.